A last minute decision not to rent our home in London so that I could have a land base (just in case) made our transition to living on Miss Tiggy much less traumatic. Mind you, Palma is pretty spectacular! 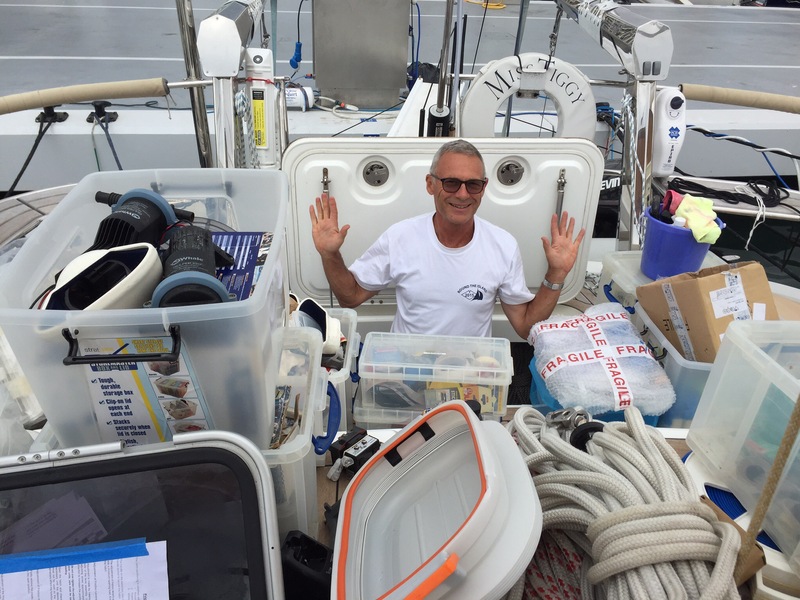 3 days with Frank (our right hand man from the Isle of Wight), logging spare parts, packing and unpacking the lazarette and getting prepared for our first foray into sharing the boat with 6 party goers in 35 degrees of heat was a test! Every day is a learning day (thank you Katie Montgomery) and the last few weeks have been some of our biggest! Problems ranging from a toilet pump that would not stop pumping, to a blown alternator (which exuded vast quantities of electrical acrid smelling smoke) and which stopped us in our tracks for 2 days didn’t take the shine off a wonderful 4 day birthday cruise for our son, Will. Come on down Theo, Aggie, Esme, Ollie & Helen! 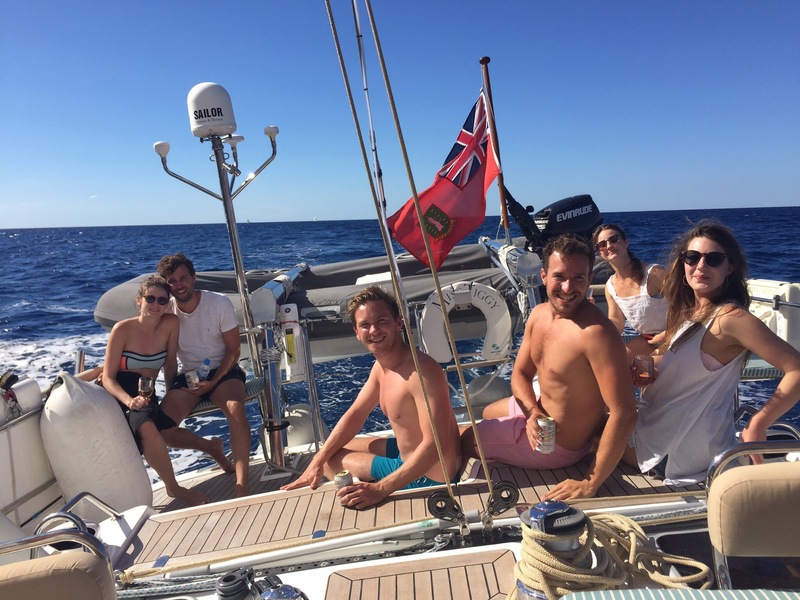 Such a fun group to share the delights of the west and north coast of Mallorca with (particularly after Esme recovered from her short bout of sea sickness). My liver is still twitching!! On a more practical note, several major decisions of a more personal nature have been made including the permanent removal of shellac from my toe nails, sleepless nights over hair tinting at sea and constant laundry. 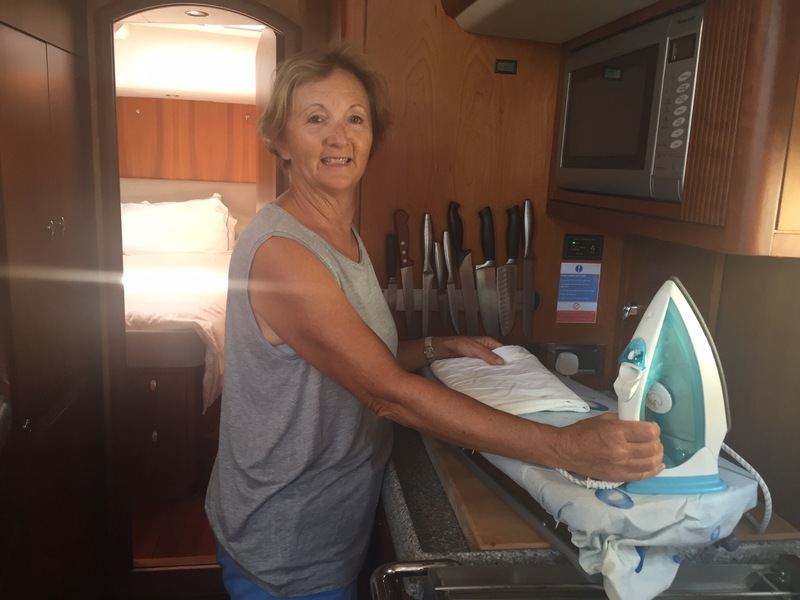 Regardless of the fact that there is a washer/dryer on board (which can only be used when the boat is stationery), copious quantities of bed linen and towels appear on a regular basis – how am I going to deal with that? Just as I was pondering this question, along the marina drove a little van with “Lavanderia” on the side – problem solved. My 2 green garbage bags disappeared into the van only to reappear some days washed, dried and ironed! Not only that but I found an iron and ironing board stowed away for our use when and if ever required again!! The next move…a one day course on “Crew Security” (how to deal with pirates etc) and a day at the Southampton Boat Show to purchase more spares and extras. Our preparations continue full steam ahead! Tiggy and James, you’re amazing taking in this journey. But you’re the perfect couple for the job. Tiggy no doubt you will will roll with whatever is thrown at you (sorry about the pun) and James you will be the meticulous Captain, which equals the best partnership. We look forward to all your posts!